Buying a new car should be fun and exciting. All too often though, it is filled with stress, doubt and worry. The U.S. Bureau of Labor Statistics states that there are over 268,000 professional car salesmen. There are far fewer professional car buyers. That’s the reason we searched some of the top resources in the automobile world like Edmunds, Kelley Blue Book, and AAA to create our tips for buying a new car. We also found some interesting thoughts from BankRate, MSN, and ABC. Before you buy your next new car, read what we found out below. Rarely do people “need” to buy a new car right away. Our first tip is to intentionally decide to take your time and do your research. There is likely no reason you have to buy a new car within a few days of making the decision to shop. Take a week or two, or even more. Visit lots of dealers and go online. Decide on what you can afford. Most people budget monthly, so go online and find one of the many free loan calculators and see how much car you can buy based on what you can afford monthly. Take your time with a test drive and take someone you trust with you. Get out and look in the trunk, under the hood. Sit in all the seats. Does the car have enough acceleration for you? Is it quiet enough? Does it sound “solid” when you close the doors? Is it comfortable? Get pre-approved for a loan. This will give you an idea as to what interest rate you will qualify for. Now, keep in mind, just because you got pre-qualified from one financial institution doesn’t mean you can’t still shop around after you find your perfect car. Shopping for the best rate can be just as important as getting a good deal on the price of a car. 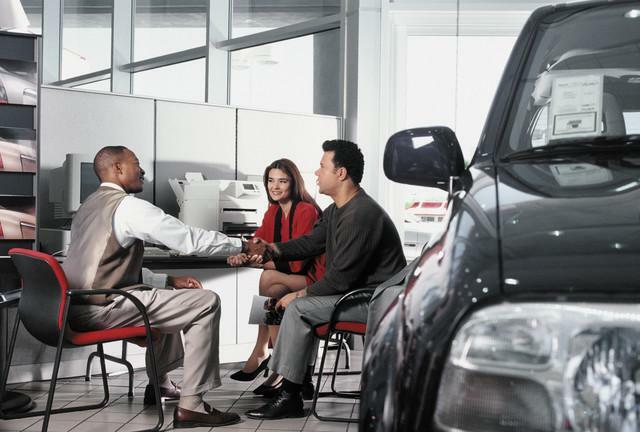 Don’t get confused by talking trade or with including dealer financing. Talk specifically about the price of the car and any associated fees. You ultimately want to compare cash, out-the-door prices. Unless you have an accountant that has some strong reasons for you to lease, buy your car. There are better times of the month and year to buy cars. The last week of the month is when dealers and salespeople are trying to “hit their numbers” and will be more willing to negotiate. Christmas is a slow period for car dealers, and in cold weather states, January is also a good time to shop. Avoid Saturdays when dealerships will have their most traffic. Traffic School can keep you safer on the roadways but you will need to look out for yourself in the showroom. It is our hope the above tips can save you stress, and money, when buying a new car.